SUMMIT COUNTY – Friends of the Dillon Ranger District placed signs, planted trees and picked up trash on Saturday along Swan Mountain Road. 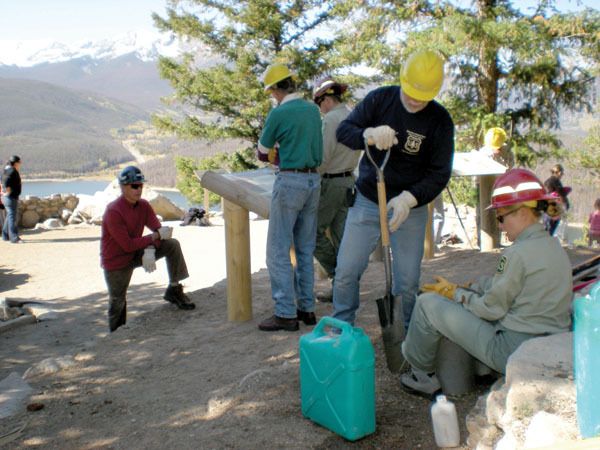 The volunteers later celebrated completing 50 such projects in 2009 with a picnic at Windy Point Pavilion. FDRD executive director Scott Fussell said about 600 volunteers were involved with this years projects, which included planting 700 to 800 trees and conducting 3 miles of trail maintenance. Between 30 and 40 volunteers helped with Saturday’s projects, which included placement of three educational signs at Sapphire Point. The signs made from beetle-kill trees include information on the mountain pine beetle, wildfires and reforestation. The Summit County Wildfire Council purchased the signs, and at least two more permanent displays are to be placed in the county, said Jim Cox, wildfire council member and Lake Dillon Fire-Rescue volunteer. Fussell said the Interstate-70 rest stop between Frisco and Silverthorne may be the site of more signs, as well as the Tenmile Canyon Trailhead. Saturday’s group of volunteers also replanted trees at the Prospector Campground, where pine-beetle infested lodgepole pines were recently cleared. Saturday was National Public Lands Day, with people across the country volunteering to improve land. In 2008, 120,000 volunteers “built trails and bridges, removed trash and invasive plants” and planted more than 1.6 million trees, according to http://www.publiclandsday.org.